We know that you need amazing service on your waste disposal in Whitechapel. You will perhaps have a lot of junk that needs clearing out of a house, or garden waste that is cluttering up a corner of your land. Either way, we can get rid of all of it with ease. Our experienced professional E1 rubbish clearance teams will be on hand to make sure that you have no issues with getting rid of it all. They are properly trained on the job, so that they know exactly what they are doing by the time you hire them. We use special vans and trucks to transport your waste items in a safe and responsible manner. This means no leaking vehicles, and no waste left behind when we are done! 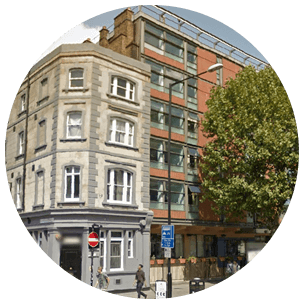 Our Whitechapel waste removal services in the E1 district are fully comprehensive, and you will find that the best way to get rid of things that you have cluttering up your home is to call us. On the other hand, you may have a large commercial office clearance job, which is too big to even consider doing yourself. We can also help with this kind of work. With our rubbish disposal in Whitechapel, you never have to worry about doing the hard or dirty work yourself, as we can cover it. Try Our Rubbish Removal Service in E1! More than just being an extra set of hands when it come to moving large amounts of junk or waste, we have the necessary skills to make your waste clearance in Whitechapel, E1 so much less of a nightmare. Many people struggle with the realities of moving waste, whereas they did not need to. Don’t get caught in the trap of thinking that you should do your own rubbish removal in Whitechapel. We can sort through your clearance items and make sure that all recyclable items are dealt with correctly, and that nothing that does not have to goes to the landfill. Whether you have a tone or two of bricks and building scrap, or you need to get rid of old clothing and toys, we are the team for the job. We offer amazing prices on our rubbish collection services as well. We hope this will remove the annoyance of having to pay to have things cleared in the first place. 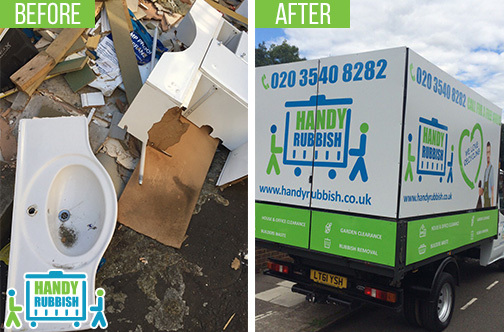 For the best value on Whitechapel waste collection in the E1 area, call Handy Rubbish on 020 3540 8282 today. I had a huge amount of junk in my property in Whitechapel but thankfully, their team were on hand in E1 and went through it all like it was nothing. The rubbish removal job that was carried out was quick and professional, not to mention mightily cheap considering what went down. Affordable services and easy to work with company! - Reviewed by James S.
Whitechapel is an area in East London, part of the London Borough of Tower Hamlets in the E1 postcode area. The region is served by Whitechapel Station, on the Overground and District Line, as well as various bus routes around the area. Until the last century, the district was seen as the centre of slum land London. It was documented in the news of Jack the Ripper’s infamous murders, and known by many as the most depraved area in the Capital. In fact it was seen as the perfect juxtaposition to the City’s wealth and therefore became a symbol for left leaning revolutionaries. Recently, however, the area has been flooded with wealth, alongside with much of the East End. Galleries and warehouse spaces that were cheap in the 70s and 80s made the area fashionable, and now those cheap places are incredibly expensive. Naturally this has lead to a gentrification of the region, and its proximity to the financial district of the square mile has meant that Whitechapel is now a richer area. The region does still have a large amount of social housing, however, with 40% of the population being of Bangladeshi origin.